The d day finally arrived exactly 2 weeks ago and I’m happy to announce the arrival of our son. To say life is hectic is an understatement and I’m getting used to the schedules of my newborn with oodles of help from my mother. Motherhood has its own unique share of joys, happiness, anxiety, trials and tribulations and I’m experiencing every bit of it. Life has suddenly changed forever. This cake was one of the few things I made just a few days before the birth of our son. It is a very versatile cake. You could serve it plain, sprinkle it with icing sugar, bake it in cups to make cupcakes or bake it in a round tin to make wedges or square tin to make squares, slice it in the centre and sandwich with your favourite jams, the possibilities are endless. It can go from being a simple everyday cake to a star attraction on the table with a little bit of imagination. The reasons for eggless baking maybe many, health, allergies, religious or any other, this is quite a useful recipe to know. I must also mention that divinetaste and my recipe for komola kheer have been featured on Kurma’s blog. Kurma das, known as the vegetarian guru of Australia is a prolific cookery author and a great chef. I feel truly honoured by his gesture. My favourite way to make this cake is to slice it in equal halves, sandwich with apricot jam* and dredge with icing sugar on top. You can also make cupcakes using this recipe. To make cupcakes, see the instructions below. The cake is more dense and rich if you use milk instead of water. I like to use water for a lighter cake. In a mixing bowl, assemble the flour, baking powder and baking soda, mix with a spoon and sieve once to make the mixture uniform. Put in the condensed milk, melted butter, vanilla extract and water into the mixing bowl containing the dry ingredients. Beat with an electric hand mixer, whisk or spoon or in a stand mixer until the mixture comes together and there are no lumps. This should take 3 to 4 minutes with an electric hand mixer/beater. Be careful not to over beat the mixture as this could result into a hard cake. Stir in 2 tbsp hot water and beat for a minute more. Pour the batter into the cake tin and bake for 50 to 55 minutes or till done. * If using jam to sandwich the cake, beat the jam in a bowl with a spoon to soften it and make it spreadable. To make cupcakes, spoon the batter into cupcake molds lined with cupcake liners and bake at 170C/325F for about 20 to 25 minutes or until the skewer comes clean. P.S. Since this is an eggless cake, you might find the batter on the looser side, but it comes out alright, soft and spongy out of the oven. Congratulations Anushruti!Hope you enjoy this truly special phase. As always, the photographs and the recipe are lovely! One doubt….what does the pic of the flower indicate? Just curious…..
Congratulations to all of you! Can't wait to see the baby! Take care. Simply mouth watering. Nice clips. 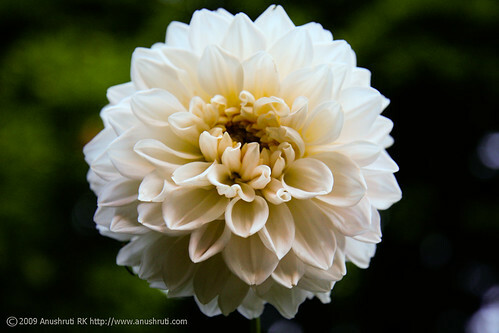 A question – what does the white flower represent & which flower is it? Beena: I hope this quells your curiosity too. This is a great recipe, we use it quite regularly, and make chocolate and fruit cake using this same basic recipe. Like you said the possibilities are endless…. Congratulations on the birth of your son. Motherhood is wonderful, enjoy every moment of it, the grow up very fast. oh and use self raising flour, and try it with some lemonade instead of water or milk. This will give a lighter sponge. Kiran: Thanks. I'm really looking forward to this phase of my life and ofcourse feeding him with all the delectable things that I can possibly make. I'm not a fan of self raising flour. Its not easily available here in India and also other parts of the world. I prefer making my own self-raising flour, if a recipe calls for it. First of all congratulations on your baby boy! must be a bundle of joy!! nice post.. and a great way to include ur baby in it ( new life). Also aunty told me that kurma das has mentioned you in his blog..thats quite something! Wishing you all the very best in all your future endeavours… keep cooking! this cake looks amazing.. i actually tried making it in a bundt and square pan… the center did not rise. i baked this on 350 degrees farhenheit for 40 minutes. the center was sort of mushy, it didn't separate as it would when using eggs. Try baking it at 300 degree F or 150 degree C for a few minutes longer. At times the oven plays mischief! The cake looks great. I have been looking for eggless recipes for ages and do hope this is it. Just a query. offlate I have started baking cakes wth oil totally doing away with the butter. do you think that is possible in this recipe? Veena: I have not tried substituting this recipe with oil. But there are other recipes of cakes on divinetaste with oil. In my opinion, butter would taste best here, oil would make the cake more dense and alter the texture of the sponge. Let me know if you do decide to use oil instead of butter in this recipe. Made this for afternoon tea and it was very well received. I'll have to bake it again for photos since half of it was gone before I could find my camera. Thank you! your cakes look great.i want to know what type of oven do you use.i am new in baking and want to buy one what would you suggest.oven or otg? Anuradha: Thanks. I'm happy you enjoy my cakes. I use a traditional convection oven or what you call the oven toaster grill in India. Set your oven to "bake" mode when baking in an OTG. I have the largest capacity Bajaj model and my new acquisition is my Siemens convection oven http://www.siemens.com/entry/in/en/. I have to tell you this basic eggless cake recipe plays a very important role for me in making my loved ones happy. This year i celebrated each of my near n dear ones birthdays with variations of this basic recipe and modifying it to make cakes of different flavors and frostings. I must thank you for this. Being a vegetarian and finding the perfect eggless cake recipe was not easy, and I was so glad when i found this. I've tried almost all the cakes featured on your site. The chocolate cake too is a bag hit with my friends. 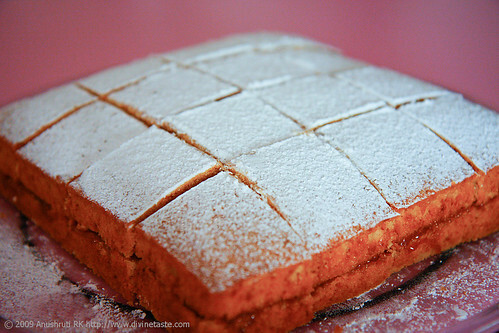 I also have a query : Is it possible to make the super-spongy sponge cake we get in bakeries without use of eggs? 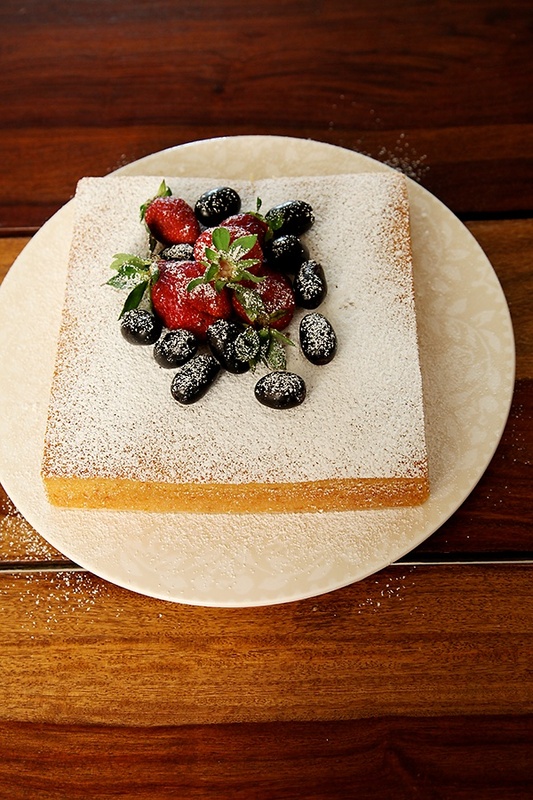 If this same recipe can me modified to make it a sponge cake can you give me some suggestions? Gauri: Cakes always make people feel special and homemade ones are a great way to celebrate any occasion. This one is a true winner with my folks too and I'm happy you like it. 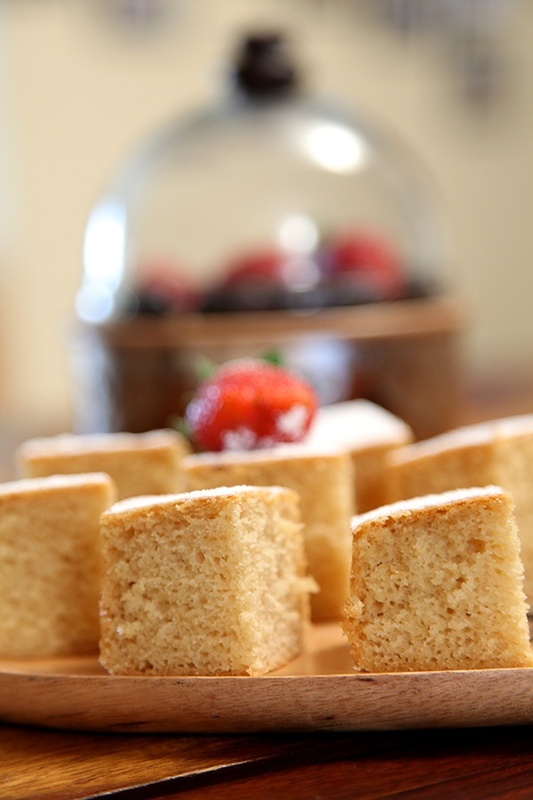 As far as your query for sponge cake goes, have you tried the vanilla cake featured here? I have given the recipe and trained folks selling eggless cakes in a bakery in Bangalore with a similar recipe, omitting the yogurt and increasing the milk. I've tried the vanilla cake featured, but will try it with the variation soon. I've tried making this same basic eggless cake with more milk to make the batter on the looser side so it comes more spongy, but I've noticed the cake turned soft, but not like sponge. For some time now I have been following your recipes here. I am a vegetarian and am always looking for egg-less baking. I have a few egg-less cake recipes and they come out well. I tried your Basic Egg-less Cake Recipe and it came out perfect. Soft and spongy. everyone who ate it could not believe it was egg-less. Thank you for the wonderful recipe. Next I am going to try the Mango cheese cake. Unfortunately the mango season is over now but I have some pulp in the freezer of our home grown organic mangoes and use that to make the cheese cake. Congratulations on being mentioned by Kurma Dasa. I just love his recipes and have one of his books. Sandhya: I'm so glad you and your family like these cakes. Eggless cakes can taste as good if not better than egg-based cakes. I'm so happy when someone reports their success like you have here. Your organic mangoes sound great. Using the pulp is an option when mangoes are not in season. Do let me know how it turned out. Ashwini: Thanks for writing in. I'm afraid I cant give you directions for microwave cooking, since I dont cook with it. I'm actually against the use of one and the one I received as a wedding gift is lying packed and unused. I'm sorry I cant help you with this. Please do consider buying an OTG, atleast a small one to start with. Anushruti – I tried the recipe and baked it in my friends OTG. It came out superbly well 🙂 Next on my agenda is to get myself an OTG. Thanks a ton for this lovely recipe. I tried posting last week, but for some reason it didn't go thru. I just wanted to thank you so much for this recipe. I recently made this eggless cake and tweaked it, but your measurements really helped me out. You have a wonderful blog here.. i really enjoy it. I'm very excited to make this cake. My daughter turns 1 tomorrow and she is allergic to eggs. I have been searching for an eggless cake recipe that sounded as if it would taste good. Very happy to have found your site. Thank you! Pinky: I have never tried this recipe with 25% butter and 75% oil. Try making it without changing the recipe. You can send me the picture by going to the contact page. I tried out the eggless cake recipe for a vegan friend and it turned out absolutely delicious. Thanks so much. Elmira: Great…thanks for the feedback! Have recommended your website to many of my friends and family members..
Neesha: Thank you for taking the time to write and for the feedback. Always love to hear from my readers and this is precious to me. Just felt like thanking you for this wonderful eggless cake recipe. I have been on the search for a good eggless cake recipe and I must say I was very lucky to get this. It turned out very well. I had baked this to celebrate Diwali with a set of under priviliged children, everyone liked it and it was enjoyed thoroughly. I made just one variation to your recipe, though I am not sure if it made any great difference. Thanks for putting up this wonderful recipe. Kavitha: You are most welcome! I'm glad you enjoyed this recipe and used it for such a noble cause. Thanks for letting me know! them into cubes and then make each cube a sandwich? cake uniformly into two halves, won't the cake crumble while cutting? Ashwini: Yes I slice the cake into two halves. The cake won't crumble if you are careful. If you are still skeptical, I suggest divide the batter into two halves and bake it in 2 8" or 9" round pans. Thanks Anu! Will definitely give it a try soon! i made em xactly like ye said it in yer blogs! gotta "taste" of heaven! simply divine! thanks anu for the sharing divinity! GOD bless..
LadySparta: Its very obvious that you have concealed your real identity by hiding under a fictitious name and are not bold enough to come out with your real self! And, who loves cowards? If what you said was constructive criticism, I would welcome it. But you have not just tried to insult my creative endeavours but also all the genuine visitors and people who have tried and tested this recipe. Instead of wasting your valuable time here if you dont care about it, why dont you go in search of something that suits your pursuits and help you make a better living? @LadySparta: I couldn't agree more with Anushruti. Your comment has brought out so many aspects of you: you do not respect creativity, you don't know what you're looking for (this is not a 'let's sell cakes' blog), you don't have enough decency to respect people, and you are flaming and disrupting harmony on an otherwise wonderful site. It is only tribute to Anushruti's decency that she did not retaliate in kind. 1. In my oven, I have to manually seethe time for preheating. Plz advise how long do I need to preheat the oven? 2. I have tried making the eggless cake but every time it deflates/ does not rise enough. Please advise where am I going wrong? 3. Is it ok to use soda instead of water or milk in the cake? Does it help in raising the cake? 4. My cake turns out to be sticky. Is it because of the condensed milk ? 4. My cake turns out to be quite sticky. Is it because of condensed milk? Priya: You can pre heat for 5 to 10 minutes…until the oven is hot enough! Since you are having many problems with your cake, it could be your oven. Or maybe you are not measuring the ingredients properly? 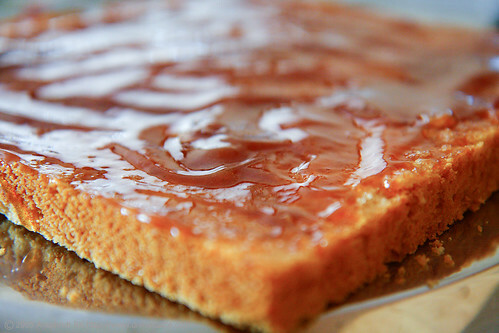 My cake with condensed milk does not turn sticky…I don't use soda to make eggless cakes so I can't really say! sonia: You can check in the cakes section of the index. kay: You can use salted butter like amul. Hi there, i just wanted to say this recipe is AMAZING!!!! goes doen well with everyone who tries it. i have made variations, like adding coconut to the batter, and then sandwiching it with rasberry jam and vanilla buttercream. Thnak you so much for sharing the recipe. RD: All your variations sound so good. Its great that you enjoyed this! I am a first time baker and decided to start with this recipe. Although the end result was tasty, I found that my cake was a little sticky and had not risen too well (though it was not hard). Could it have been the temperature in the oven? My OTG manufacturer recommends that I always preheat the oven to 200 degrees for 10 minutes before use for best results. I followed the recipe and preheated at 120 degrees and followed the rest of the recipe. Kindly let me know what could have gone wrong and if I should preheat to 200 degrees or 120 degrees. I am so happy that i found your website since i love eggless baking.As i am from a middle class family so we don't have a oven but since i am so interested in baking so i am planning to buy an OTG so can you suggest me that what should be the capacity(ltrs.) of the oven and the max. temperature range to try all your recipes. Niki: Don't pre heat your oven to 200 C. You can go upto 150C max. But it seems like there was nothing wrong with the temperature. If you use more liquid or sugar than that stated in the recipe also you will find the cake a little sticky. Make sure you measure your ingredients well before you make this again. Genelia: Nice to hear from you! It is better to go for the largest capacity in the OTG as you can bake a considerable amount at the same time. Besides it will take in cake tins upto 10" or a little more than that. All the best! I made this and liked it a lot.. However, I have a basic question on baking cakes. The cake came out soft and spongy in the inside. It looked just like yours in the picture with pores in it. But the outer crust of my cake came out little hard. Especially the surfaces in contact with the baking pan came out hard and were much more brownish (like an over-baked color). The top most surface was not that hard. I just cut the outer crust with a knife and enjoyed the inner cake.. What do you think the reason for this is? This has happened to me many times.. Please help. Thanks. I made this cake yesterday and it tastes & looks yummmy.Hubby Dearest & my son just loved it! Thanks for this recipe!It looked plain so just to enhance it a bit I made choc icing and decorated it .But overall,a big hit in my home! Ashwini: It looks like your oven needs a lower temperature setting. Ovens behave differently at times. Try setting your oven to a lower temperature and see if the problem is rectified. vani: You could use either. chitra: this tastes so good with chocolate icing. Glad that this worked for you. Thanks for a wonderful site. I tried baking this cake and it turned out pretty well.Have you tried baking a larger version of this? How do I adjust the oven times/temperature and quantity of the ingredients, if I want to make a 9×11 or a 11×13 cake, instead of the 8" or 9" that you used for this recipe? Preheat oven to 180°C. Grease and line a small baking pan (8×12) with butter. Combine dry ingredients directly in the pan. Mix all the wet ingredients. In a small bowl, combine remaining ingredients leaving out the vinegar until the final step. Combine wet and dry ingredients, stirring together in pan until well combined (do not beat or over mix just stir / fold to combine – it is ok if the batter is slightly lumpy). Stir in the vinegar rapidly and immediately place pan into preheated oven and bake for 25 to 30 min. Optional: You can stir in 1/2 cup semi-sweet chocolate chips just before baking to make a richer cake with melted chocolate bits or swirls. Lovely recipe. Made for mother in laws birthday. She was pleased! That says it all! Vanilla and springy? Yes, I have to try this. The recipe looks so simple, too! Thank u for sharing all yur wonderful recipes. I baked this cake for our Guru Purnima festival yesterday and all the devotees really enjoyed. knock offs. Added room in a good deal of laundry rooms can be like establishing genuine estate in New York Metropolis. As an egg free food tech student, your recipes have been perfect! Every time I make this cake it turns out beautiful, today I am making it in cupcake cases because it is too difficult to find an easy vanilla cupcake recipe. can I bake this cake in a microwave ? ine has a convection mode in it but I don't know how to start with. could you please help me? Thanks in advance . I by chance came upon your website while surfing and my oh my am I impressed. Because we are vegetarian..love your recipes for eggless bakes. I want to start with the basic cake recipe. Is there anyway to substitute the condensed milk. Also can i bake this in a microwave. I have a convection model. Thank you very much. Waiting eagerly for your response. I want to know the difference between plain flour and self raising floor. How do you prepare your own self raising flour? And is it Maida? Will be glad to get a reply. 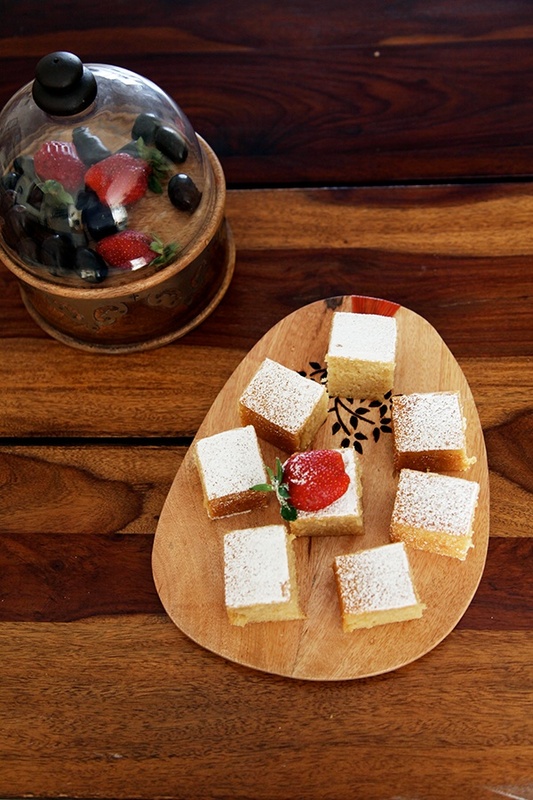 Sheela: Condensed milk is an intrinsic part of this recipe but if you want a cake without condensed milk then look in the cakes and cookies section, you will find many cakes without condensed milk. I don't use or recommend baking or cooking in a microwave oven. Sorry! Megha: Plain flour is maida. For every 100 gm of maida use 1 tsp of baking powder and 1/8th tsp baking soda and you have your own self raising flour. Hey, just wanted say how much i love your blog! I was also curious if you had a recipe for an egg-less Swiss roll? Your recipes are awesome but more so.. have to compliment you on your blog.. This is the only blog, out of thousands of others that I have seen, that is so crisp and neat! Great job! Kamya: Thank for your appreciation! The simplest, easiest, and foolproof eggless cake recipe, I must say. Made it today and it's so simple. The minimal ingredients and the simple recipe is what made me get up and bake this one. And not to mention the temperature, time, everything mentioned in your recipe is perrrrrrfect. I added a few fresh strawberries and blueberries ( just because I wanted to finish them), and choco chips. Anushruti, your blog has some of the most reliable recipes ever. Good luck to you and please keep posting such simple yet delicious recipes. You completely deserve all the accolades that are coming your way. Neelam- Thank you for your kind and inspiring words. Thank you so much for the perfect recipe.it turned out very smooth,moist and tasty.my kids loved it. Sudha- Great to hear that! Thanks! Hi could I use this recipe as a base- cake for Tiramisu? Hi! I tried your recipe after reading the great reviews but i was dissapointed! The cake was dense at the bottom and it was a caramel colour as opposed to a yellowy colour. Too much raising agent in the recipe perhaps?? Who knows! Jess- I'm sorry that this recipe didnt work for you, but this happens to be one of my best basic cake recipes. If your cake was dense at the bottom and a caramel colour it is possible that the temperature of your oven was not right. Did you bake in the middle rack? Did you measure and mix the ingredients as stated? I can assure you that if the recipe is followed to the T, there are little chances for this to go wrong. I have baked this eggless sponge cakei bundt pan. Hereby attaching the link of my page. I did this thrice in one day.. and trust me the result were same all time. In this receipe, if I add trutti frutti then whether it will works? In this receipe can we add trutti frutti. Sapna- Yes, it would work. Keerthi: Yes, you can! You can double, triple or even quadruple the recipes. Kavitha: You can add 1/2 cup to 3/4th cup. Is self raising flour ok to use? This is a great recipe, Thank you dear for sharing, I found some very interesting recipe and cake ideas from your blog. Wow!!! It looks very versatile cake. It must be very yummy. Great work. How to bake this as cupcakes. Please let me know the time &/ temperature alterations. Dv- No. Self raising flour already has some raising agents in it, so it will be too much for the cake. Kanitha: Bake at the same temperature for 20 to 25 minutes. Hi when you say 175ml water/milk – do you mean use 175 of water or milk or a mixture of both? Sneha: Water or milk, not both. Wao, A simple and delicious cake recipe and i am really happy to get this lovely egg less cake recipe. I will definitely try it at home.